For anyone interested in the practice of democracy, this year’s Labour Party conference in Brighton was a fascinating event. That didn’t appear to include most of the journalists paid to report on it, who evinced no curiosity about developments on the conference floor, preferring instead to focus on the usual manufactured outrages and gossip from outside the hall. That was a shame, because while in 10 years’ time no one will remember that Laura Kuenssberg was accompanied by a bodyguard, the 2017 event will go down as the conference at which party democracy started to make a comeback. This was a conference full of conflicting dynamics, but with an overarching story of left delegates gradually asserting themselves as they learned the ropes. An enormous 1,200 delegates attended, many for the first time, making this the biggest Labour conference in memory. Around two-thirds of the delegates from local constituency parties were firmly of the left, judging by the results of contentious votes, and far more were broadly supportive of Jeremy Corbyn. In the ballot for two seats on the party’s National Constitutional Committee, the left candidates won 71 per cent of the delegates’ vote. For experienced leftists accustomed to decades of losing, it was a dizzying experience to suddenly be in a commanding position. The fact that the left has emphatically won Labour’s civil war was obvious from the reception that greeted the leader’s every appearance and the endless (overdone) chants of ‘Oh Jeremy Corbyn’. It was also seen in the spontaneous standing ovations, given to Diane Abbott mid-way through Corbyn’s speech, to Len McCluskey for just taking the stage (leaving him visibly moved, his hand on his heart), and to Dennis Skinner after delegates demanded he be chosen to speak from the floor. John McDonnell might have considered himself hard done by, only receiving three standing ovations during his speech. 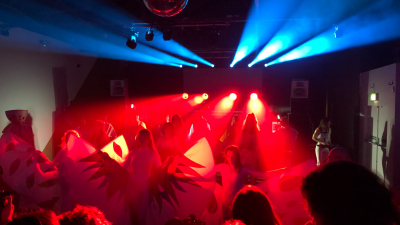 This jamboree was a world away from the previous year’s conference, when the left was in a minority among constituency delegates, despite the party re-electing Corbyn as leader with 62 per cent of the vote. Ironically, that year’s attempted coup against Corbyn was a major spur to the left securing its majority this time round, as left members realised it wasn’t enough just to elect the leader. Adversity has fuelled the Corbyn movement. The left’s dominance in Brighton was down to organisation. The Campaign for Labour Party Democracy played its traditional role, helping local parties submit motions and rule changes and coordinating tactics at conference. But this year it had a powerful ally in a newly effective Momentum. In the run-up to conference Momentum encouraged members to become delegates and gathered their details, enabling it to provide real-time guidance during the conference itself via their phones. This organisational effectiveness afforded it great influence. 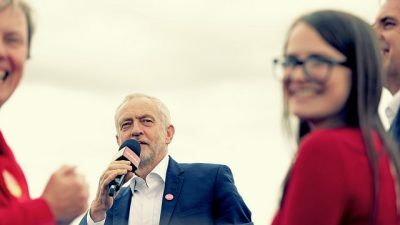 Party democracy has been a long-time aspiration for Corbyn, but bureaucratic blockages meant little progress was made in his first two years as leader. That is now changing, but there is not yet a fully worked out vision of how a democratised party will work. The evidence from the 2017 conference suggests that Corbyn’s version of democracy is far from a free-for-all. Having organised for months in advance of contentious votes over rule changes, many grassroots activists felt deflated when their efforts were displaced by an old-fashioned deal brokered by the leadership at the party’s National Executive Committee (NEC) in the week before Brighton. Instead of fighting it out on the conference floor, local parties were asked to withdraw proposed rule changes such as the so-called ‘McDonnell amendment’, intended to reduce the proportion of Labour MPs needed to nominate a leadership candidate to ensure someone from the left has a chance to succeed Corbyn. In a compromise, the NEC agreed to lower the nomination threshold from 15 per cent of Labour MPs to 10 per cent, rather than the 5 per cent that would otherwise have been voted on. Crucially, the NEC decided to expand itself with three more seats for constituency parties and one for trade unions, giving Corbyn a majority on the powerful committee. 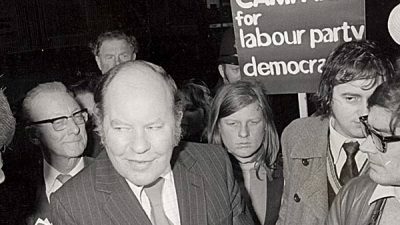 And it toughened the party’s rules around prejudice, including antisemitism, in what the Jewish Labour Movement claimed as a victory, but which was really a partial climbdown by the group. Most significantly, the NEC announced a wide-ranging review of party structures, to be undertaken by Corbyn’s political secretary Katy Clark. This brought the possibility of sweeping democratisation, but it would come from above, shaped by the leader’s office, rather than being won bit-by-bit through rule changes at conference. The NEC deal was skilful, traditional party management from the leadership – securing big wins while avoiding a row – but it risked demotivating Corbyn’s activist supporters. As conference got underway it looked like the biggest obstacle for the pro-Corbyn contingent would be the absence of obstacles. Delegates who had come ready for a fight initially found there wasn’t much to fight over. Separately, the leader’s office won a behind-the-scenes battle over Labour’s policy on Israel-Palestine. The call for ‘an end to the blockade, occupation and settlements’ made in the 2017 election manifesto was outrageously omitted from the annual National Policy Forum report, which constitutes Labour Party policy once agreed by conference. On day one in Brighton, in the daily Conference Arrangements Committee report, the text mysteriously reappeared. While left delegates were delighted, no one knew quite how it had happened. In fact, the leadership, which was livid at the omission, had simply put its foot down. The bureaucracy may also have calculated that had it not conceded, the section would have been challenged, or ‘referenced back’, by delegates in any case (see below). One story from the conference floor did make it into the press: that ‘Momentum blocked a full debate on the EU,’ as Nick Cohen put it. Talk of party democracy was a sham, bellowed the entire media, the Labour right and elements on the far left, if conference could not vote on the ‘most important’ issue of the day. According to Marina Hyde in the Guardian, delegates were denied the chance to take a ‘contemporary motion’ on Brexit by ‘a classic old-style fix’ supposedly ‘masterminded’ by Momentum founder Jon Lansman. What actually happened was rather less exciting. In a ‘priorities ballot’ constituency delegates themselves voted overwhelmingly to debate motions on the NHS, social care, housing, and rail instead. The allegation of a ‘fix’ arose because these four topics were recommended by Momentum. But this is also known as ‘organising.’ And – shock horror – the right was organising too. On the day of the priorities ballot, Labour First, the coordinating group of the party’s ‘old right’, distributed a ‘Voting Guide’ leaflet recommending delegates choose to debate Brexit. It was difficult to discern why Momentum’s actions were inherently more fiendish. Perhaps it was the temerity of using electronic communications instead of paper leaflets. Or maybe the problem was simply that considerably more people were listening to them. According to the incessant whining noise that goes by the name of Richard Angell, Corbyn-supporting delegates were too stupid to know they were being manipulated. They ‘only rejected the topic [of Brexit] because they trust the Momentum leadership and followed their instructions,’ without realising that the ‘position is dishonest,’ he wrote. In reality, delegates perceived perfectly well what was going on. When one speaker suggested from the podium that the ‘real intention was to undermine Jeremy Corbyn’s leadership’ he got a standing ovation from the majority of the hall. Although MPs like Chuka Umunna and Progress chair Alison McGovern moaned that ‘our party isn’t going to be able to consider the biggest issue facing us,’ there was actually a lengthy, scheduled debate on Brexit. And while Workers’ Liberty complained that ‘conference has spent a lot of time discussing Brexit… but not voted on anything,’ there were in fact two votes. Conference voted through an NEC statement setting out the leadership’s Brexit position. But more interesting was a vote taken at the request of a delegate from Nottingham South. She called for party policy to be ‘referenced back’ to the National Policy Forum, saying the UK should ‘remain in the customs union and the European Economic Area’. Had conference wanted to, it could have seized this chance to send a message to the leadership. Instead, the vote against the ‘reference back’ was, in the words of the chair, ‘overwhelming’. The votes suggested that nothing like a majority of constituency delegates (never mind the trade unions) thought it was a good idea to tie the party to the mast of single market and customs union membership when the politics of Brexit is fluid and changing. Even if enough delegates had prioritised a motion on Brexit, it is unlikely it would have passed. The attempt to ‘reference back’ party policy on Brexit did turn out to be significant, but for a different reason. The power to ‘reference back’ individual sections of the annual National Policy Forum report was new, the result of a rule change won at the 2016 conference. Previously, delegates were only given the option to accept or reject the National Policy Forum report in its entirety. If it was rejected, Labour would effectively have no policies. Unsurprisingly, it never was. In this way, policy making was kept at arms length from the conference – a legacy of New Labour’s determination to marginalise the party. In the run up to the 2017 conference, regional Labour staff briefed delegates that no one knew what would happen if a section of the National Policy Forum report was ‘referenced back,’ but it sounded scary. Conference might break down. The world might stop spinning. On the first day of conference, no one attempted it. On the second morning, the delegate from Nottingham South asked to ‘reference back’ the section on Brexit. Although her attempt failed, a taboo was broken. The process was revealed to be easy. You just shouted out ‘reference back’ and went up to the stage to explain why. That afternoon a delegate from Taunton Deane asked to ‘reference back’ a section on welfare policy because it failed to ‘explicitly commit to scrap all planned welfare cuts.’ Momentum sent out word to support him. Delegates were suspicious – without foundation – that the chair would attempt to sidestep the vote. There was tension in the hall. A show of hands had to be taken several times. The bulk of constituency delegates were in favour. 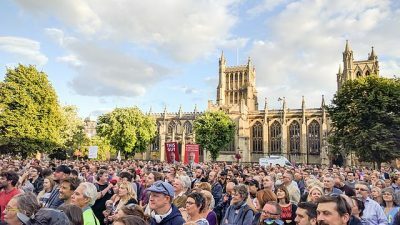 But the voting power at conference is split 50-50 between the constituencies and affiliated organisations, meaning that despite enjoying a clear majority among the local party delegates, the left could only win votes with the support of at least one, and usually two, of the big unions (Unite, Unison and GMB). When the affiliates were asked to do a show of hands separately, it was clear that some unions, including Unison, supported the ‘reference back’. It was carried. For the first time, conference had sent a section of Labour policy back to the National Policy Forum to reconsider. This was fluid democracy on the conference floor. The delegate from Taunton Deane, Fraser Amos, was not from the left but from Open Labour, a ‘soft left’ or consensus-seeking group. Momentum hadn’t known that he intended to challenge Labour’s welfare policy, and decided to support him on the spot. This was the opposite of a stitch-up. Indeed, the effect was to begin to unpick the stitched-up National Policy Forum process. On the third morning, delegates arrived in the hall with new confidence. For an extraordinary hour conference verged on open rebellion. For a while it felt like proceedings might fall apart entirely. There was a call to ‘reference back’ the Conference Arrangements Committee report, effectively the agenda for the day, because an emergency motion on the issue of suspensions from the party had not been chosen for debate. The vote was too close to call by a show of hands, but was lost on a card vote (where the number of members or affiliated members a delegation represents is counted), with most of the unions in opposition. Even the treasurer’s financial report – usually a dull conference formality – sparked heated debate. The first delegate to respond demanded to know how much the party spent on the Compliance Unit, the body responsible for suspensions and expulsions. Although these votes did not change party policy in themselves, they were significant victories. The effect of a ‘reference back’ is to tell the National Policy Forum to go away and try again, and present something better to the following year’s conference. The mechanism could prove key to re-establishing conference’s long-lost authority over policy. To avoid endless calls to ‘reference back’, the National Policy Forum will have to produce reports that delegates agree with. It will no longer be able to neuter policy without challenge. It was striking that constituency delegates became more assertive day-by-day. Their caricature as Corbyn ‘cultists’, interested only in pleasing the leader – ‘children who cannot handle the robust debates of a free society’, in Nick Cohen’s words – could only be advanced by people who either didn’t understand, or had no interest in, what unfolded on the conference floor. On the penultimate afternoon in Brighton, 64 per cent of constituency delegates supported a rule change that put them at odds with Corbyn, who wanted the motion to be withdrawn so Katy Clark would have a free hand in her review of party structures. 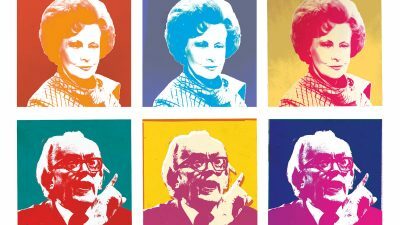 While the rule change – which would have removed the need for motions from constituency parties to focus on ‘contemporary’ issues – didn’t pass due to opposition from the unions, delegates were well aware that in supporting it they were going against the recommendation of the NEC and the leadership. There was palpable frustration in the hall at having to ‘remit’ other rule changes in favour of the pre-agreed package won at the NEC. There were shouts of ‘Don’t do it!’ when speakers went up to withdraw their constitutional amendments – especially when it came to the original ‘McDonnell amendment’. Far from being a cult, the conference had a mind of its own. Aside from the votes, the feel of proceedings was unrecognisable from the New Labour days, when ministers would deliver drab perorations to half empty halls. With more time set aside for delegates to speak, there was an energy in the room, a participative spirit. Conference was unpredictable, at times edgy. The healthy lack of deference was encapsulated in a moment following deputy leader Tom Watson’s speech. At its finale the entire shadow cabinet came out for a group photo amid a standing ovation. But as soon as the feel-good display of unity was over a delegate got up to remark that Watson had gone on for 22 minutes having been allotted just 5. The breadth of knowledge and talent within the party’s ranks could be glimpsed from the three-minute speeches made by delegates. Several talked about specific problems within schools, social care services, or the railways. It was, at times, genuinely impressive, and occasionally emotional. Instead of broadcasting their own views, shadow ministers sat and listened, imbibing the priorities and instincts of a transformed party. In my book The Candidate I traced the different political strands that wound together to form the Corbyn movement – the Bennites, left trade unionists, and social movement activists. These various traditions could be visibly observed at the rostrum. An experienced trade unionist putting forward their demands would be followed by a Disabled People Against the Cuts campaigner delivering an impassioned speech. A veteran leftist asking for a procedural clarification would be followed by a one-time Occupy activist decrying homelessness. The various strands were knitting together, live on stage. All of this was still a fair distance from the ideal of a democratic, truly sovereign conference. ‘Referencing back’ to the National Policy Forum is no match for setting policy directly. The number of contemporary motions debated was small. But, after a two-year lag while the left got its organisational act together, this was the first Labour conference to bear the imprint of the Corbyn era. It was a confident first step on the path to a democratic party. And it was the delegates themselves that forced the pace. Alex Nunns is the author of The Candidate: Jeremy Corbyn’s Improbable Path to Power. An updated edition covering the 2017 general election will be out before Christmas.